Work: Admitted to Massachusetts Bar, 1761; Elected to Massachusetts Assembly, 1770; Attended First Continental Congress, 1774-’76; Signed Declaration of Independence, 1776; Appointed Diplomat to France, 1776-’79; Member of assembly to form State Constitution of Massachusetts, Minister plenipotentiary in Europe, 1780, ’81; Party to the Treaty of Peace with Gr. Britain, 1783; U.S. Minister to the British court, c. 1783- ’88; Elected first Vice President, 1789; President, 1796. Adams began his education in a common school in Braintree. He secured a scholarship to Harvard and graduated at the age of 20. He apprenticed to a Mr. Putnam of Worcester, who provided access to the library of the Attorney General of Massachusetts, and was admitted to the Bar in 1761. He participated in an outcry against Writs of Assistance. 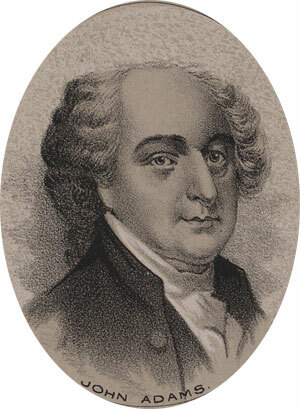 Adams became a prominent public figure in his activities against the Stamp Act, in response to which he wrote and published a popular article, Essay on the Canon and Feudal Law. He was married on Oct. 25, 1764 and moved to Boston, assuming a prominent position in the patriot movement. He was elected to the Massachusetts Assembly in 1770, and was chosen one of five to represent the colony at the First Continental Congress in 1774. Again in the Continental Congress, in 1775, he nominated Washington to be commander-in-chief on the colonial armies. Adams was a very active member of congress, he was engaged by as many as ninety committees and chaired twenty-five during the second Continental Congress. In May of 1776, he offered a resolution that amounted to a declaration of independence from Gr. Britain. He was shortly thereafter a fierce advocate for the Declaration drafted by Thos. Jefferson. Congress then appointed him ambassador to France, to replace Silas Dean at the French court. He returned from those duties in 1779 and participated in the framing of a state constitution for Massachusetts, where he was further appointed Minister plenipotentiary to negotiate a peace, and form a commercial treaty, with Gr. Britain. In 1781 he participated with Franklin, Jay and Laurens, in development of the Treaty of Peace with Gr. Britain and was a signer of that treaty, which ended the Revolutionary War, in 1783. He was elected Vice President of the United States under Geo. Washington in 1789, and was elected President in 1796. Adams was a Federalist and this made him an arch-rival of Thos. Jefferson and his Republican party. The discord between Adams and Jefferson surfaced many times during Adams’ (and, later, Jefferson’s) presidency. This was not a mere party contest. The struggle was over the nature of the office and on the limits of Federal power over the state governments and individual citizens. Adams retired from office at the end of his term in 1801. He was elected President of a convention to reform the constitution of Massachusetts in 1824, but declined the honor due to failing health.